People use Vermont State Parks for a variety of interests and activities, and you just might be surprised what you can do in the parks. For instance, Mt. 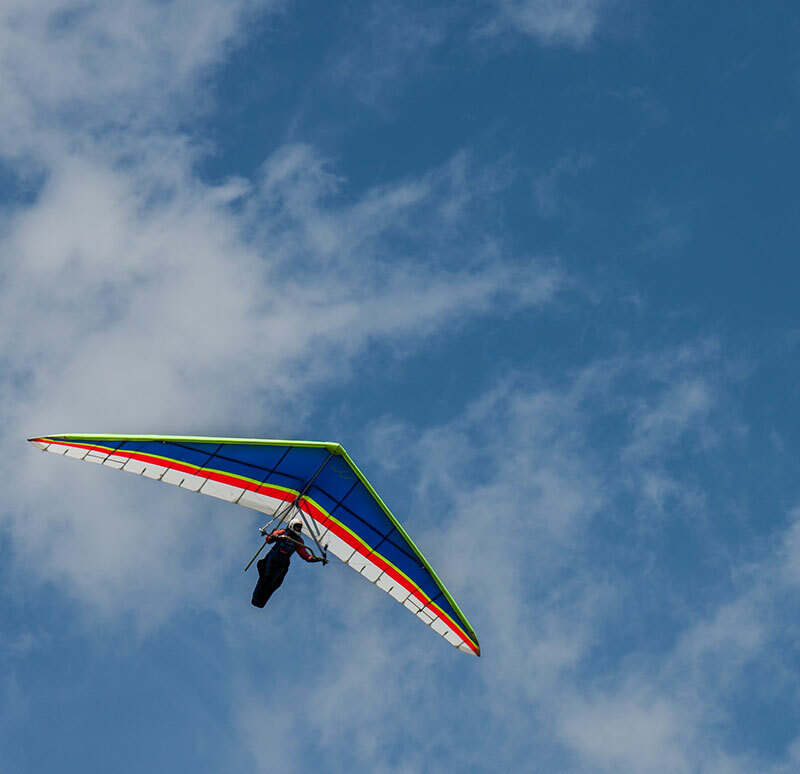 Ascutney State Park is one of New England's premier hang gliding spots. New Discovery State Park is awesome for horse camping. You'll find ice climbers in Smugglers Notch and gold panners, metal detectors and geocachers all over the state. Geocaching is a high-tech treasure hunting game played throughout the world by adventure seekers equipped with GPS devices. The basic idea is to locate hidden containers (called geocaches) outdoors and then share your experiences online. Geocaching is enjoyed by people from all age groups, and it fosters a strong sense of community and support for the environment. There are geocaches all over Vermont State Parks. If you'd like to create your own cache in a state park, please see our Geocache Policy (PDF), then fill out our Geocache Request Form (PDF) and email or mail to the address on the last page. Use of metal detectors is a hobby for many, and can be a benefit to a park in that finding and removing metal objects from beaches, parking areas, and campsites helps prevent injury and/or damage to vehicles and equipment. The downside is that many parks are located in areas of historic and archeological significance and removing artifacts from state land is against the law. Also, the accompanying digging (when an object is found) can disturb turf areas and/or rare or fragile plant and animal communities. Disturbed areas shall be restored to their original state. Artifacts of historical significance are property of the State and must be surrendered immediately, along with any information as to the location of the find. You're probably familiar with the famous California Gold Rush, but not many people know that one occurred in Plymouth, Vermont. Farmers discovered placer gold in Broad Brook and for a time gave up their farming to pan for gold. Canny Yankees that they were, they soon calculated that they weren't really earning more money than they had from farming, and the Vermont Gold Rush was over. Gold can still be panned from Broad Brook today. Camp Plymouth State Park is a favorite location for gold panners. Gold panning rules: The use of mechanical techniques is prohibited. Gold panning is permitted by traditional hand panning technique only. For purposes of clarification, “mechanical means” refers to any type of machinery or equipment that is motorized, powered or has working/moving parts. Sluice boxes and rocker boxes are considered mechanical equipment. Hand tools may be used to move material around and from a stream bed into a gold pan. Material may only be moved from the stream bed and not from a stream bank or area that is susceptible to destabilization. Examples of hand tools are small shovels or pry bars. Mechanical devices such as sluices are not permitted on state lands, only traditional hand panning methods are permitted. Gold panning is not permitted in state wildlife management areas. Hunting is a valuable cultural tradition in Vermont, and many people engage in this activity for recreation and sustenance. 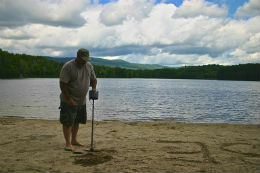 Your best resource for hunting and fishing information and regulations is the Vermont Department of Fish and Wildlife. Valid Vermont hunting (trapping) license and compliance with existing regulations are required (see "Vermont Hunting, Fishing and Trapping Laws and Guide"). Hunting is generally allowed at state parks after the operating season but is prohibited within 500 feet of any state park building, and in certain other designated areas. Two parks stand out in particular for horse camping: New Discovery State Park and Camp Plymouth State Park. At New Discovery, there is a seven site horse camping area. The horse camping area features a hitching post, water spigot and trough for watering horses. Just up the roadway, and past the toilet/shower area, is a horse washing station. Other pets are allowed at designated camp sites. There is also many miles of hiking on multiple use trails. Horse camping is also permitted at Camp Plymouth State Park where horses are allowed in the group camping area on the south side of Buffalo Brook. The area consists of six lean-tos, pit toilets, tie-off station, manure “bin,” and a large field for activities. On the north side of the brook is a large picnic area, playground, sandy beach, horseshoe pits, volleyball nets, concessions, and boat rentals. No animals are allowed elsewhere in the park. Camp Plymouth is a place for people who want to camp and then go elsewhere to ride. While there isn’t a horse trail system in the park itself, there are other areas close to the park offering many trails. Mt. Ascutney State Park is one of the premier hang gliding locations in Vermont. Good ridge soaring, excellent thermal flying, and cross country flying. Many flights from Vermont to the Atlantic coast begin at this launch. Many New England pilots have their first cross-country flight from here to Morningside Flight Park, which is 9.8 miles downwind. Well known for its 1/3 mile hike to launch through the woods and rocks. Snowkiting is an outdoor winter sport where people use kite power to glide on snow or ice. It's similar to kitesurfing. Snowkiting differs from other alpine sports in that it is possible for the snowkiter to travel uphill and downhill with any wind direction. Snowkiting is becoming increasingly popular in places often associated with skiing and snowboarding - like Vermont. Sand Bar State Park is a popular location for snowkiting.